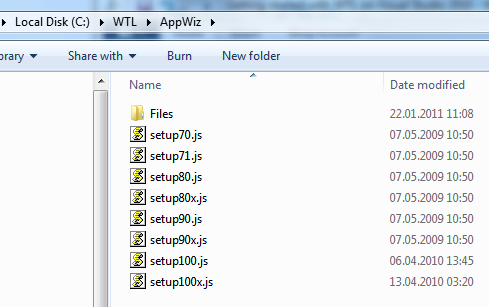 I recommend you to extract the files to the same location were you installed the WTL files. In my case this would be c:\WTL. 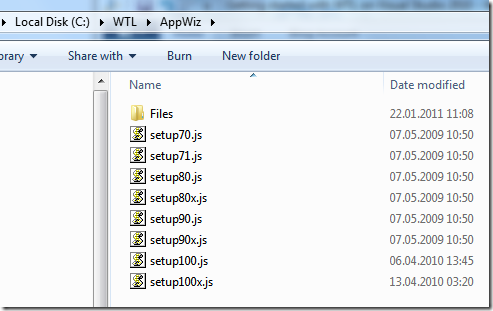 Double click the setup100.js file (or setp100x.js for Visual Studio 2010 Express) to install the WTL Project Wizard. Bummer. How to solve that? You really don’t want to have to include the WTL include path in every VC++ project. Here’s how to set the global paths and include the WTL include path. It’s really not that intuitive, if I would say. First you will need to have a project open in VS 2010. Then go to View->Other Windows->Property Manager. In the Property Manager, expand the project and the platforms nodes. 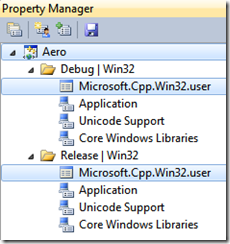 Multi-select the two Microsoft.Cpp.Win32.user items. (By holding down the Ctrl key and select them each by the mouse). Now you finally can set the global default search paths for the VC++ include directories. In my case I have added the C:\WTL\Include path. Save the properties settings restart Visual Studio. Now, happy WTL’ing in Visual Studio 2010.